On a day off this week we tootled up to Squamish with our mountain bikes to ride Farside – a tight series of techy little trails strewn with rocks and roots that bounce you off in all directions if you’re not on your game, and tired, as we were. It’s a pretty area though, as were the tiny orange and reddish flowers I noticed, scattered amongst the grass at the head of the trails. They caught my drawing eye and I couldn’t resist plucking one stem to take home. (Instant disclaimer here, I know that sounds bad, and it is, but it’s the first time I’ve ever picked what I thought might be a wildflower; they seemed daisyish, i.e common, growing in a semi-rural area behind a housing estate, so I figured they weren’t fully fledged precious wildflowers – however I admit I didn’t know what they were so the excuse is lame). Once home I propped the stem in a jar of water and had to wait until the next day to draw them – the flowers had endearingly closed their petals for the night. A couple of hours work the following day and I had my drawing. But I had no clue what the flowers were exactly. 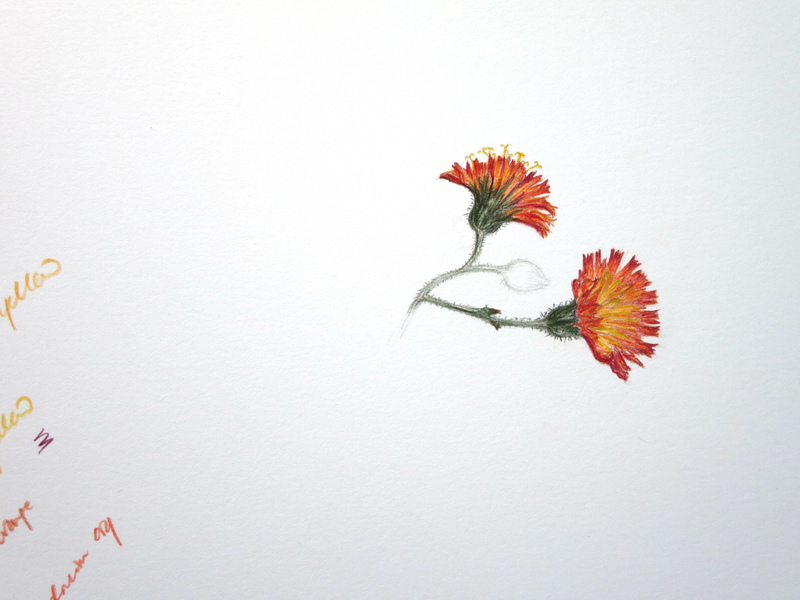 An exhaustive search on the internet revealed nothing at first (I was looking for native flowers) until I reframed the question and there it was, orange hawkweed (Hieracium aurantiacum): native to parts of Europe but considered highly invasive here in British Columbia. It’s a feisty plant, spreading rapidly, starving out space for native plants, thereby reducing foraging for local wildlife. Dog walkers, hikers, and mountain bikers are encouraged to report any sightings of the plant and its location. Sigh. I dutifully fired off an email to the local Invasive Species Council, indicating where we saw the flowers and admitting I had a stem of the pests sitting in our apartment. I was surprised how quickly they got back to me, thanking me for letting them know and sternly (my guilty interpretation) directing me to place the flowers in a sealed bag and take them to a transfer station or landfill – most definitely NOT to put them in the compost. Sometimes things become way more complicated than you expect. They are pretty flowers though. I know what you’re saying, and to a degree agree. But I guess my counterpoint to that would be that we humans have accelerated the spread of invasive species to a staggering degree (much like our impact on climate change) and the native populations have no time to adapt. I think the devastating effect introduced rabbits had on the environment in Australia is a good example of that. Funny thing about orange hawkweed, it’s protected in some parts of Europe! Right flower, wrong place!